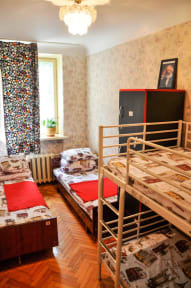 My first experience in Moldova, first time in Retro Moldova Hostel in Chisinau, Great! Expected and welcome recieved, kind staf, clean room and comfortable beds. Do not expect a relaxroom with a television or a bar, do not expect a breakfast with croissants and orange-juice but who cares? You can buy coffee and sandwiches in 20 mtr from the hostel and that is also al waiting area for taxis, wich is great. Thank you for your services and a special thanks to Jerome who is a great host! !